February 27, 2014 - The peaceful protests over the past week by individuals and businesses alike have shown the world what the face of democracy looks like in Arizona. All ages, races, creeds, genders, socio-economic levels, and sexual orientations have joined in unity in favor of inclusion and equal protection under the law. I am thankful Governor Brewer made the right decision for Arizona with the veto of SB-1062. It was a discriminatory bill that threatened the rights of all Arizonans. I urge the legislature to shift its focus to addressing the critical issues facing Arizonans such as job creation, strengthening our public education, and fixing the failures of Child Protective Services. These are the problems that deserve immediate resolution! Arizona must work hard to restore the faith of the businesses and opportunities it lost and assure that civil rights are inalienable rights. True change in Arizona policy can only take place with change in leadership. Arizona voters are urged to participate in November’s election. Further efforts to divide our grand state must be prevented. Together, we can make Arizona’s future brighter. 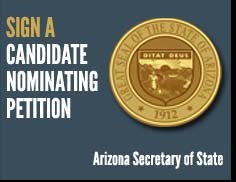 To learn more about Kristie O’Brien and how to support her candidacy for the Arizona State Senate - Legislative District 17, please email Kristie@OBrienforAZSenate.com.